The Verdict: At first blush this was not a very good chicken Parma for a couple of reasons. First and foremost at the point of ordering I was directed to pick up my salad from a fridge which meant I had it 15 minutes before my meal came. Add to that the fact that there was no ham and this Parma was never going to rate highly. It is important to note though that Parma was comparable in quality with those other Parmas that I have trialed so far from RSLs. Chicken Piece: Size wise this chicken piece was one of the larger ones I have tested so far. It was well cooked and crumbed. I have to say though it did have the consistency of a chicken burger pattie from a fast food restuarant: just larger. Tomato Sauce: The absolute hero of this dish. The sauce provided a great coverage to the large chicken piece and tasted great. Ham: Missing … enough said. Cheese: There was a good covering of cheese on the G-Z Parma and it was well melted. This element complemented all of the other aspects of the dish very well. Side Dishes: Both the chips and the salad were disappointments. There just was not enough chips and when the came out they were already a bit cold. The salad was taken by me directly from the fridge. You could tell on the eating of it because it was still cold 15 minutes after I collected it. Presentation: As the salad was procured in a seperate bowl from the fridge a large portion of the very large plate this meal was provided on was redundant. The Venue: The Geebung-Zillmere RSL is a largish RSL located in Geebung, quite close to the railway station. It has a number of bars, two eating venues and a phalanx of pokie machines. My parma was, to be fair, over priced at $24 (as a non-member). The Final Word: Judged against all of the other chicken parmigianas I have tried so far this was pretty ordinary. It lacked ham and the side dishes were not great. The price point on this parma was also a quite significant negative. That said, if you are going to the Geebung-Zillmere RSL with expectations of having an RSL Parma then the lack of ham aside you will not be disappointed. 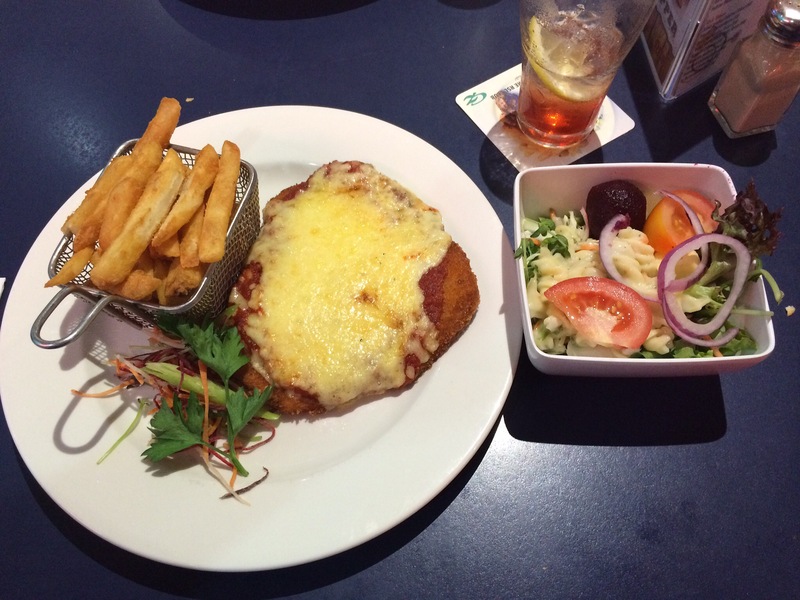 This entry was posted in Uncategorized and tagged Brisbane, brisbane food, brisbane's best parma, chicken parmigiana, food, Geebung-Zillmere RSL. Bookmark the permalink.